The conductors shall be pre-tinned. There shall be at least 3 turns around each conductor and the wraps shall be tight with no gaps between adjacent turns. The wraps shall not overlap and the ends of the wrap shall be trimmed flush prior to soldering to prevent protruding ends. Conductors shall not overlap the insulation of the other wire. Solder shall wet all elements of the connection. 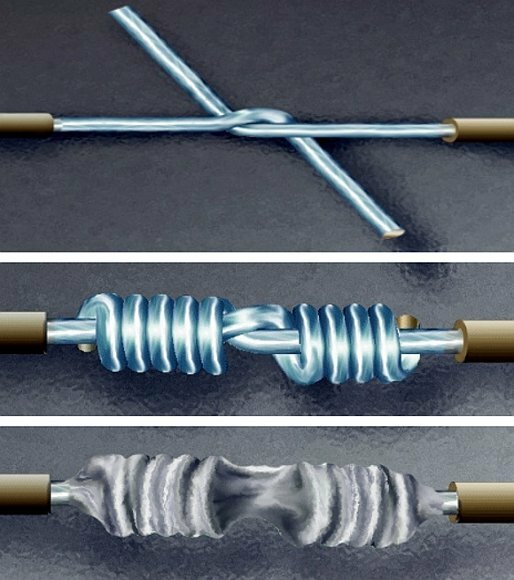 This material comes from page 84 of NASA-STD 8739.4 (PDF), which is a great reference if you’re interested in best practices for interconnecting cables and wires.